The entire spectrum of the power industry is in our DNA. We offer proven energy storage solutions designed for the full range of applications in the market, with delivery and integration in 160 countries. Our comprehensive service offerings address the complete customer journey, including advisory, financing, and project lifecycle services. Our energy storage technology and service offerings are built from a rock-solid foundation of 10 years of lessons learned in designing, deploying, and operating complete energy storage solutions. Unlike packagers who don’t understand the true complexities of energy storage solutions, or suppliers that only understand certain parts of the system, the Fluence team brings a deep understanding of how to put all the different pieces together to make your project a success. We are here to partner with you to solve your energy challenges and help you navigate the rapidly changing landscape. Fluence tops Navigant’s energy storage leaderboard. 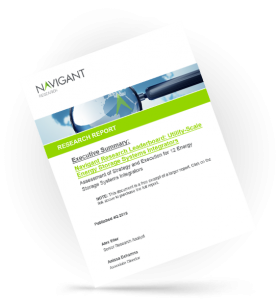 Navigant Research names Fluence the Leading Energy Storage System Integrator.